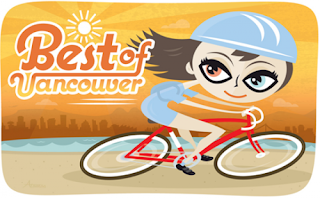 Vancouver Critical Mass: Fwd: [BikeHUB] Best of Vancouver (Straight Poll): BIKE LANES!! Fwd: [BikeHUB] Best of Vancouver (Straight Poll): BIKE LANES!! There is some of the usual editorial nastiness, as even this edition of the Straight searches for ways to polarize its readers with hot-button negativity. This despite the Reader's Choices (see above). "And if you disagree with any of the writers' choices in our Best of Vancouver issue, you can make your opinions known at www.straight.com/. After all, we're still living in a democracy, even if it doesn't seem like it to those who are outraged about bike lanes being rammed into their neighbourhoods without their consent."